It’s common knowledge that James T Kirk’s middle name was Tiberius. Recently, however, I started watching the original Star Trek series for the first time in about 20 years, and spotted the production error in the episode ‘Where No Man Has Gone Before‘ in which a gravestone with Kirk’s name on shows his middle initial as ‘R’. Given that ‘Tiberius‘ is a bit of an odd choice of name anyway, it brought to mind that other odd name from popular culture, ‘Indiana‘. As Henry Jones Senior points out (with his Scottish accent) in ‘Indiana Jones and the Last Crusade’, “We named the dog Indiana“. 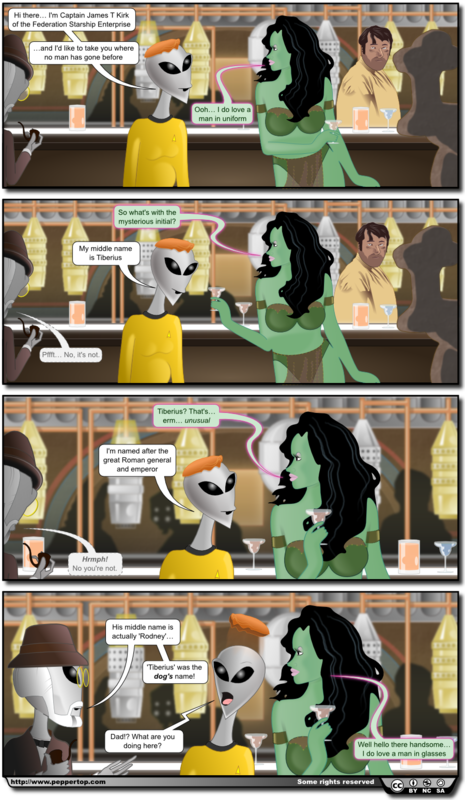 Hence this Star Trek/Indiana Jones crossover comic… which for some reason seems to be set in a bar in a galaxy far, far away. Slave Girl: So what's with the mysterious initial? Old Man: Pffft… No, it's not. Old Man: Hrmph! No you're not. 'Tiberius' was the dog's name! Kirk: Dad!? What are you doing here?